HENRY (Harry) BRAY was born in Barnetby-Le-Wold, Lincolnshire, on 10 May 1855. He was the son of Robert Bray and Sophia Bones and the sixth child in a family of seven. He grew up there. His father was a horse dealer, who turned farmer. When Henry was in his mid-teens, around 1870, the family left Lincolnshire and moved to North Yorkshire. In the 1860 census, Henry is still at school at 15, rather later than most boys of his age. His father was now a tenant farmer with 2000 acres, employing two men. They moved to South Cote farm, Burton on Ure. This village lies in the parish of Masham on the eastern edge of the Pennines, 8 miles NW of Ripon. Here Robert died in 1800. Sophia took over the farm. Shortly before Henry’s marriage in 1881, the census shows him, aged 25, still living at South Cote. Mary Harland was a domestic servant at the farm. But it is likely that the two knew each other before she came to work at South Cote. Mary had grown up in a farmhouse where Robert Bray, Henry’s married older brother, lived. 1881 Census. South Cote, Burton On Ure, Yorks. MARY ELIZABETH HARLAND was born a few miles from Burton on Ure, in Mickley, on 16 August 1859. She was the daughter of Thomas Harland and Mary Dinsdale. Her father was an overlooker in a textile factory spinning flax. Her father died in 1864 when Mary was only 4. Four years later, in Jan 1868, her mother also died. Two siblings had died in infancy, so Mary was left an orphan with her older brother Alfred. The children were separated and sent to different uncles and aunts. Mary went to live with her father’s brother Samuel Harland, who had married her mother’s sister Jane Dinsdale. In 1871 Mary Elizabeth Harland was living at Aldburgh Farmhouse with her uncle and aunt, Samuel and Jane Harland, Samuel being an agricultural labourer, Robert Bray (a brother of Henry) was also living there with his wife Jane, and daughters, Sophia and Mary. So it is possible that this is where Mary Harland and Henry Bray met. In the next few years the teenaged Mary went to work as a servant for Henry’s parents Robert and Sophia Bray at South Cote. When she was 18, she had a daughter Kate Bray Harland, apparently fathered by Henry Bray, although it was another three years before they married. Kate was born at Burton on Ure. In the 1881 census little Kate is living at the family farm with her still unmarried parents and listed as Robert and Sophia’s granddaughter. Henry and Mary married in Masham on 18 April 1881. They returned to South Cote, where, according to the 1901 census, five more children were born: William 1882-3, Ruth 1883-4, Rose 1885-6, Almina 1887-8 and Frank 1889-90. Another source shows Rose born in nearby Mickley. Henry is variously described in censuses as a farmer, carter, etc. He was also a great hedger and won prizes for this. Pamela Maryfield, a descendant, says he was a horse dealer and farmer, who moved around, a description which would certainly apply to his father Robert Bray. There is a family tradition that Mary gave birth to Almina under a hedge. In the 1891 census the family are in the parish of Aughton, in the East Riding. 1891 Census. Front Street, Aughton, Howdon. Mary’s age seems to have increased by a couple of years. Five of the children are unexpectedly listed as being born in Southport, Lancs. In the following census this changes to Southcote, Yorks, which is much more credible. The enumerator must have misheard the place name and added the county himself. They kept moving, from the North Riding of Yorkshire to the West Riding. The next child, Evaline, was born on 16 Sep 1891 and baptised in Aughton, 6 miles west of Sheffield, on 1Nov. Her father Henry is then described as a labourer. In the next census her birthplace is given as South Milford, a village 13 miles west of Leeds. The parents had difficulty remembering the birthplaces of their numerous children. Robert Henry was born in the last quarter of 1894 in Aughton. 1897-8 saw them settled at last in Earby, Thornton in Craven, five miles north of Colne and very close to the Lancashire border. In the second quarter of 1897 Mary Sophia was born in Earby. She was followed in the third quarter of 1900 by Lily, also born in Earby. Henry loved the horses. He would walk to York Races, apparently from Earby. The 1901 census shows this large family all living at 41 Colne Road, Earby, Thornton in Craven. Henry is now a driving a coal cart and the teenage children are employed as cotton weavers. 1901 Census. 41 Colne Road, Earby. ily’s granddaughter, Jean Etheridge says: “When I was a child, my Grandma, Lily Sanderson (nee Bray), told me she should not have been born. She then went on to tell me that her Mother had a baby girl called Ethel May, who had been born with a broken back and had died shortly after being born, the doctor had then told Mary not to have any more children. In fact Ethel May was born on the 21st of May 1899 and was baptised at St Mary’s Church, Thornton in Craven, she died on the 31st of October 1899, the cause of death was actually measles and croupus laryngitis, certified by A Falconer, MD. Mary went on to have two more children, Lily and Mabel. 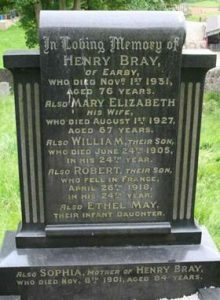 “Lily Bray was born on 8th of August 1900 at 1 Hartley Street, Earby. However this address does not appear on the 1901 census so I can only assume that where 1 Hartley St would be, there was a coal yard and stables, so it is possible that the family were either living above the stables, or Mary just happened to be there when Lily arrived, if Almina was born under a hedge it’s quite feasible that Lily could have been born in a coal yard. Mabel was born in the third quarter of 1903, also in Earby. Their son William died on 24 June 1905, aged 23. In the third quarter of 1907 Rose married Robert Priestley. She was already pregnant at the time. The family are still in Colne Road at the time of the 1911 census. Seven children are now at home. The youngest is Mabel, born since the previous census. William, Ruth and Rose have left home. 1911 Census. Colne Road, Earby via Colne, West Riding, Yorkshire. Although no family relationship is given, Kate Adams was the child of Harry Bray and Mary Harland, born before they were married. She appears as a 3-year-old child in the 1881 census. She appears to have moved with them to Earby. In 1898 she married a local lad, Robert Adams. There are said to have been twelve children in all. Pamela’s mother Mary Sophia was almost another generation from the older sisters who helped bring her up. She married Ronnie Cowgill, a postman and champion cake-decorator. In 1911 Harry’s brother Tom, whom their mother Sophia had been living with in 1901, was boarding with the Fish family in Jubilee Terrace, Kings Road, Barnetby le Wold. He had returned to his birthplace in Lincolnshire. No others of his family are with him. He had left them behind in Shipley and was working as an excavating contractor. Panel 82-85 and 162A, on the Tyne Cot Memorial at Zonnebeke, West-Vlaanderen, in Belgium. There is no grave, indicating that his body was never found. Tyne Cot is a Memorial to the Missing. His death is also recorded on Earby war memorial. the death of their son William in 1905 at the same age. 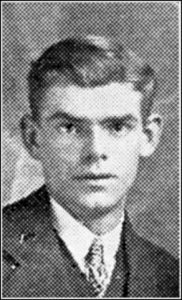 Norris died in March 1918 and is commemorated on the Arras Memorial. The death was registered by her daughter Mary S Cowgill, who was in attendance at the time. She lived at 12 Barnwood Road, Earby. Henry had gone from being a farm bailiff in 1891 to a farm labourer before his retirement. He died from a stroke on 1 November 1931, also in Thornton-in-Craven. He was 76.